Welcome to the Go For Greece Training Group Blog Hop. We are a group of Stampin' Up! Demonstrators from all around the world. We have one thing in common - our desire to earn a wonderful cruise to the Greek Isles. And we are all working together and taking the most amazing training to give us the best shot. But first and foremost is our desire to create pretty things. So sit back and be inspired by all the wonderful creations from all around the globe. Here is my card. I used the fabulous Springtime Foils Specialty Designer Series Paper on this card. This paper is just devine. But more about that later. Now that you have seen my creation, how about you check out what every one else has done. If you get lost, just come back here and carry on. I am Narelle Fasulo. As I mentioned earlier, I used the beautiful Springtime Foils Designer Series Paper on this card. The spotty background and the flowers are from the pack. This paper is more like card stock weight and can be used in a multitude of ways. One way is to colour it as I have done here. 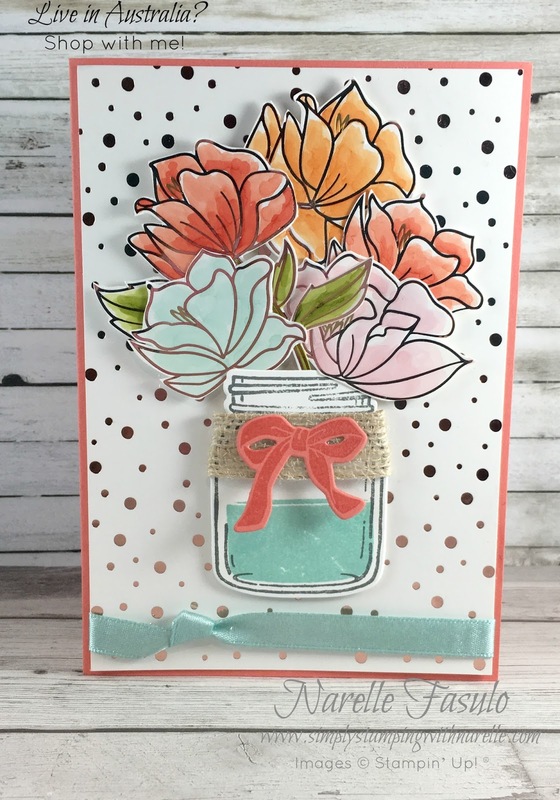 I used Stampin' Blends to colour the flowers. This paper is FREE during Sale-A-Bration with a $90 or more order. But hurry, Sale-A-Bration finishes in a few days. Don't miss out and order today HERE to get this gorgeous paper for FREE. Stunning card Narelle. Genius to put these flowers in the Jar Of Love! Love it Narelle! I'm going to have to case this!! Just beautiful!! This Springtime Foils dsp surely adds the WOW factor!